The second-largest family of butterflies in the world with aproximately 6000 different species. The African Monarch is a common butterfly found throughout South Africa. Its coloration is mimicked by several butterflies due to its poisonous nature. Larval stage feeds mostly on the toxic milkweed. Common along coastal and riverine forests. Caterpillar matures into a highly reflective golden pupa. Larval stage feeds on Cynanchum and Tylophora creepers. Smaller than similar colored Friar. Common along coastal and riverine forests. Most active at dusk and on cloudy days. They are attracted to fermenting fruits. Laval stage feed on certain grass species among other plants. Flight period restricted to summer months. Larval stage feeds on certain grass species. Common garden species with the laval stage occuring in large numbers on wild peach trees (kiggelaria africana). Often seen over-wintering on garden walls etc. in the larval stage, where it will appear motionless until spring when it will pupate. Male usually more brightly colored than the female. Common along the eastern parts of South africa. Laval stage feeds on Adenia Gummifera creeper among others. The host plant Triumfetta tomentosa is generally seen as an undesirable weed and removed from domestic gardens. Butterfly can be quite common in areas where its host plant is available. Restricted to eastern parts of South Africa. 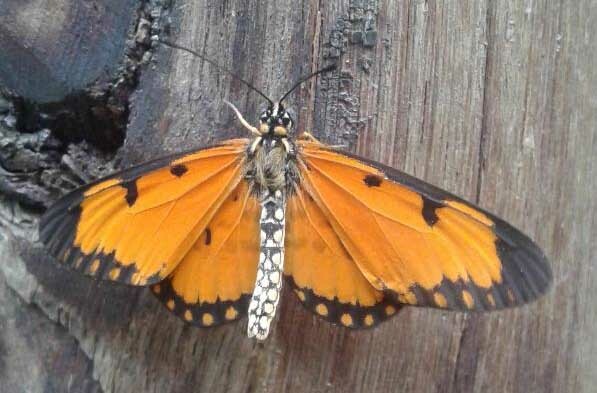 There are different colour forms of this butterfly. Easy to confuse with white-barred Acraea and common wanderer. Laval stage feeds on species of stinging nettle and other plants. Widespread along the South African eastern coastline and inland. Laval stage feeds on trees of the Allophylus family. Male has two tails of equal length, female has one tail longer than the other. Found in eastern parts of South Africa and beyond our northern borders. Larval stage feeds on Forest Mahogany among others. Male black in color. Female patterned as in illustration. Larval stage feeds on certain species of Albizia, Acacia and others. Male and female with distinctly different coloration. Male more intensely colored than female. Found in upper eastern parts of the country. Larval stage feeds on a range of plants which include species of Chrysophyllum. Larval stage feeds on Albizia adianthifolia among others. Found in eastern parts of South Africa and further north. Larval stage feeds on Tragia glabrata. Found in eastern parts of South Africa and down into parts of the Western Cape. Larval stage feeds on stinging nettle. Larval stage feeds on stinging nettle and Castor oil plant (an alien invader). Common in most parts of South Africa except for some areas in the Cape. One of the female forms appears very similar to the African Monarch. Larval stage feeds on creeping fox glove and other plants. Common in eastern parts of South africa. Larval stage feeds on buckweed, fox glove among others. Male and female similar but distinct wet and dry season forms. Form sesamus - dry form - blue coloration. change of season results in a combination of the two forms, referred to as an intermediate form. Common in the eastern parts of South Africa. Larval stage feeds on various species of plectranthus. Larval stage feeds on species of Plectranthus. Restricted to eastern coastal areas. Common in coastal regions of KwaZulu-Natal. Larval stage feeds on creeping foxglove and Phaulopsis Imbricata. Male and female similar. Females have dots on hind wings. Common throughout the country except for most parts of the Cape province. Larval stage feeds on creeping foxglove among others. Male and female similar. Female with two red circles on each hind wing. Widespread throughout South Africa excluding most areas of the Cape. Also referred to as the Ox-eyed pansy. Widespread but not as commonly seen as the other pansies. Common in most parts of South Africa. Larval stage feeds on some Gazania species among others. Restricted to south eastern parts of South Africa. Larval stage feeds on Laportia peduncularis among others. 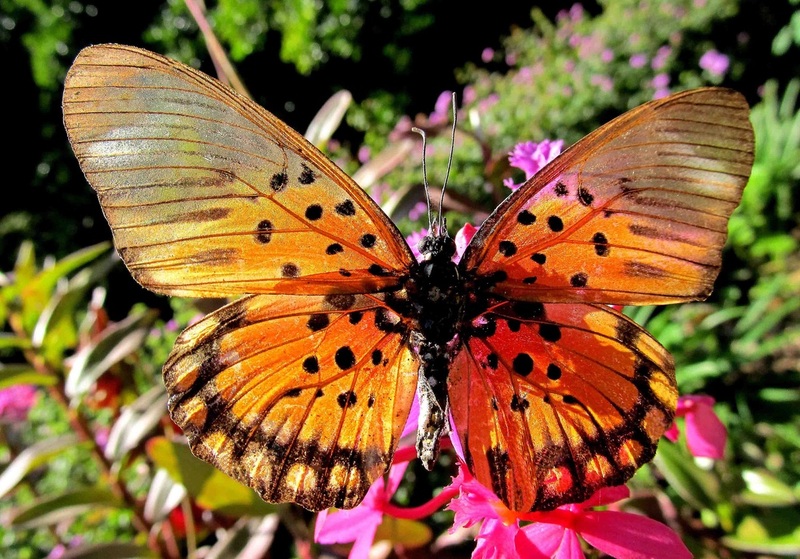 Also referred to as 'small orange acraea'. Females can vary in colour. Easter parts of South Africa. Larval; stage feed on species of Triumfetta.